In June 2016, the eight-member Legislative Council Committee submitted to the Parliament of Victoria the final report of the inquiry into end of life choices. In this report, the committee recommends the legalisation of doctor-assisted suicide and euthanasia in Victoria. The committee suggests that doctors should be authorised to prescribe lethal drugs to dying patients who can use them to end their life. The committee also insists that, for a person who is physically unable to take the lethal drug, due either to disability or incapacity, 'a doctor should be able to assist a person to die by administering the drug'. In October, the Voluntary Assisted Dying Bill will be debated in parliament and then voted on before the end of the year to determine whether assisted suicide and euthanasia will be legalised in Victoria. If the bill is passed, Victoria will be the first state in Australia to legalise euthanasia and assisted suicide since the NT Rights of the Terminally Ill Act was annulled two decades ago. In 1996, Northern Territory passed the Rights of the Terminally Ill Act to legalise euthanasia. This was overturned less than a year later by the federal government. Since then, other euthanasia bills have been rejected in Victoria, South Australia, and Tasmania. In the last few years, euthanasia campaigners such as Andrew Denton and Dr Rodney Syme have presented stories of persons dying in unbearable distress to argue the case for assisted death. Last year in The Australian, Denton reportedly told the 'church to get out of euthanasia debate'. In the aftermath of the royal commission investigations into institutional responses to child sexual abuse, the religious voices are frequently dismissed by the public on this issue. The 2016 report also puts forward the arguments in support of change in law. It argues that euthanasia legislation would (1) enhance individual autonomy or self-determination, (2) provide relief from suffering for patients and loved ones, (3) prevent suicide by other means, and (4) benefit the doctor-patient relationship. It also argues that (5) assisted dying occurs already and is unregulated, and (6) assisted dying is a form of palliative care. These arguments are either erroneous or simply naïve. First, as British actress and disability rights advocate Liz Carr said in her captivating address to Victorian parliament on 22 March 2017, euthanasia legislation would lead to further coercion against vulnerable persons in society: the elderly and people with disability. Once voluntary suicide is legalised, to continue living becomes a choice that people will have to justify to themselves, their family, and society. "In this context, legalising euthanasia would diminish individual autonomy, not enhance it, if we consider the most vulnerable persons in society." It is especially the case for persons who have to depend on the assistance of others: the elderly, and people with disability. Note that elder abuse is currently a growing concern in Australia. The Australian Law Reform Commission is calling for law changes to protect elders from abuse at the hands of their children and carers. One suggested intervention is a national register of enduring powers of attorney in order to 'prevent greedy children from using the document as a "licence to steal" from their elderly parents'. In this context, legalising euthanasia would diminish individual autonomy, not enhance it, if we consider the most vulnerable persons in society. Second, the role of palliative medicine is to relieve pain and suffering, but not by killing the ones who suffer. The Hippocratic Oath which gave rise to modern health ethics explicitly states, 'I will neither give a deadly drug to anyone who asked for it, nor will I make a suggestion to this effect.' Within this medical tradition, the goal of medicine is to save lives, to promote health, to relieve pain and suffering, and to care for patients. Intentional killing of patients is not a medical treatment, and assisted suicide is not a form of palliative care. Third, legalising assisted suicide is not an answer to the problem of pain and distress in the dying patient, but improving the quality of palliative care and access to it for Victorians is. Stories of 'horrible deaths' cited by Denton and Syme often highlight the need for advance care planning and palliation, rather than the need for euthanasia law. It should be noted that within current Victorian laws, the use of analgesics and sedatives to relieve pain and distress for patients with terminal illness is justifiable even if it can lead to the hastening of death. In this case, the principle of double effect would justify the administration of analgesics such as morphine for the purpose of relieving pain. The argument that medical suicide will prevent suicides by other means is not very coherent. Fourth, as Professor Margaret Somerville points out, the medical profession is trusted because it carries the value of respect for life in a secular society. Authorising doctors to cause their patient's death would damage the doctor-patient relationship by undermining that trust. In Canada, increasing numbers of doctors request to be removed from the 'assisted dying' lists after they assisted patients to die. Euthanasia legislation would result in great harm not only to vulnerable individuals and populations, but to health professionals as well. Fifth, the key difference between palliative care and euthanasia is the intention behind the medical intervention. In palliative care, the intention is to care for the patient by relieving pain and distress. In euthanasia and assisted suicide, the intention is to cause the death of the patient. For this reason, euthanasia and assisted suicide are radically different from palliative care. The British House of Lords (9 May 1994) regards the prohibition of intentional killing 'the cornerstone of law and of social relationships'. To overturn this prohibition would undermine the very fabric of society. For these reasons, the Voluntary Assisted Dying Bill in Victoria must be rejected. Hoa Dinh SJ is a lecturer in moral theology and bioethics at Catholic Theological College, and an ethicist of Mercy Health Australia. When I started nursing training in 1979 I never heard euthanasia discussed openly. Three decades later, when working in aged care, people talked about it constantly. Many now expect their relatives to live into very old age in good health. The extended lifespan is often only achieved by a combination of artificial interventions such as cardiac drugs, antibiotics and immunisations. Frequently this allows a chronically ill elderly person, who may well also have advanced dementia and incontinence to survive illnesses which would have ended their life even one generation ago. Also our society is in denial about the reality of death and dying: sadly many dying people die in an institution such as a hospital, surrounded by professionals, rather than in the safety and comfort of their own home. I believe all these factors have led to the current push for euthanasia. We need a major rethink about how we care for the elderly and terminally in our society, and also a lot more honesty and openness about death and dying. I wonder whether the House of Lords stood with respect to 'the prohibition of intentional killing' being 'the cornerstone of law and of social relationships' when it acquiesced to Britain's prosecution of the Second Gulf War? Surely anyone who accepts the arguments made in this article must also be an absolute pacifist? Dear Fr Dinh, thank you very much for giving hope to ALL who care for the elderly with divers medical conditions; loving professionals, family members, volunteers and friends in aged care facilities, hospitals, hospices and private homes. Yes! Palliative Care is the answer. And those who know this truth proclaim: " Where, O death is your victory?" What a contrast to the devious euphemisms evident in the campaigning of euthanasia proponents. Clear, reasoned and constructive, Hoa Dinh. The arguments against this new legislation are deeply flawed and ignore completely the successful experience in all those jurisdictions where assisted dying is already allowed. It is simply untrue to suggest that palliative care is a solution in all cases, and assisted dying is designed to cater to those whose suffering cannot be palliated. The Victorian laws contain more safeguards than anywhere else in the world, and there has been no significant evidence to suggest that similar legislation has been abused. No country that has legalised assisted dying has found it necessary to rescind those laws, and none of the fears exhibited in this article have been shown to have any validity. This is a humane and much needed progressive step forward and we should not be swayed by ill informed and misleading fear mongering. In my view, the new legislation will NOT diminish the freedom and autonomy of vulnerable members of our society. Quite the reverse. In my experience of speaking with groups of elderly folk, they feel empowered by having more choices available to them. I stress the need to plan upfront for the inevitability of death. Speak to family members, and have your wishes clearly stated in a legal Advance Care Directive. Voluntary Assisted Death (VAD) legislation will support clear planning of one’s end-of-life choices. I have witnessed death, as many of us have. I see no merits – moral or humane – in lingering when death is nigh. Rather than being reduced to having no options as one’s body disintegrates, I would rather say “Goodbye” to my loved ones, and exit with dignity and grace. I believe I have the right to this choice, and wish to exercise that right in a legal and open manner. Others can choose another path; that is their right. The VAD legislation will give ALL members of society the right to choose. The euthanasia bill will definitely put the elderly and dependent who are not suffering but who are a burden to others at risk. In my work as a specialist surgeon over some 45 years I didn't have one request to be put down from a patient but quite a few from non-coping or inheritance seeking relatives. And my job serviced some terrible suffering. John, that’s your opinion, but the only evidence that you offer is your experience. But it’s dated, and would you ever expect anyone to ask for something that during those 45 years of experience was illegal and unattainable? Those of us who have witnessed the deaths of parents from cancer unrelieved by palliative care must disagree with your assertions. Deep end of life sedation is a prospect which offers no comfort, only fear. I think our ideas on euthanasia are terribly coloured by a sort of utilitarian, mechanistic view of the human body and human life. One of the most impressive TV programs I have ever seen was a visit by a British TV interviewer to a Hindu establishment in Varanasi where relatives were attending a wonderful old lady who was in the process of dying. The place was nothing like a hospital, though it was certainly clean and very colourful in a wonderful Indian way. The matriarch was deeply loved and respected and the family obviously well to do and certainly not waiting for her to pass on for financial gain. A good hospice is our equivalent. Euthanasia legislation is a very complex situation and there are very, very intelligent people like Liz Carr and Carmel McNaught on opposite sides. I can understand someone like Professor McNaught, who, if I read her correctly, wants to take responsibility for herself and not to endure a long and lingering death. Many people, if they write medical directions about their last days, often indicate, in the case of serious, extremely painful illness, that they want palliative care only. I would certainly be cautious of the sort of legislation in the Benelux countries where I believe a young person with severe depression can voluntarily suicide. Liz Carr also made a very impressive case. We need to proceed with utmost care. It is complex, as you say, Edward. Some people already opt for palliative care rather than invasive procedures and some opt for no resuscitation in the event of heart failure. Some, in future, will opt for active termination. The legislation that is proposed is not the Benelux legislation but much more conservative. Hoa's article makes some good points but as a Jesuit in a Catholic theological college he could hardly have come up with any other conclusion. Dear GM. I am happy to be outdated just as I quite like antique furniture and art from the nineteenth century !Suddenly and unexpectedly facing the truth of one's mortality is very sobering. I have experienced this both for my own life and for my wife's life. Believe me, the urge to cling to life is very real, even when in possession of belief in the promise of an idyllic afterlife in paradise. Truth is never dated, GM, although it has become unfashionable in our world (like antique furniture and classic art). Fashions come and go, unlike truth which is immutable. In our world, however, truth threatens human rights. I spent my life cultivating a distinct dislike for death but did realise its inevitability in some poor souls and on many occasions turned off fruitless life-support machines and relieved suffering with doses of morphine that carried a risk to life while relieving suffering. To me, doctors who support euthanasia have never truly faced either life of death - such failure in both instances is an appalling lack of courage and concern for their fellow men. Such healers, privileged as the champions of Life, have delegated healing to Death..And Hippocrates wept ! GM I didn't think that you considered me outdated but rather the concept of euthanasia as a taboo was outdated. How could anyone of our age be outdated, GM ? To have the practical effect of implying that those who are old and infirm should justify their decision to continue living is to pick on a vulnerable section of the community and is, therefore, in contemporary parlance, being 'phobic' towards them. Euthanasia laws, having this practical effect, are thus gerontophobic. ‘practical effect... of implying... should justify.... continue living... to pick on... therefore... phobic...’. That’s a pretty long bow to draw Roy. Would you, personally, as you get older, really feel that way? Would you really see no ‘practical’ alternatives? Have you not considered the safeguards built into the bill? Yes, thank you John, it was the concept of the taboo that I was challenging. An author, whose name I can’t recollect at the moment, writing on the subject of legends, asserted that all legends are created by some group In some context at some time for some purpose, or words to that effect, and I think the same goes for taboos. In that context, legends and taboos can serve a useful purpose, but in another context at another time they can become irrelevant or even get in the way. Here is an experience that appears to be the very opposite of the wish for euthanasia. My sister was told she was terminally ill. The doctor urged her to have surgery. "Without it, I can assure you, you will die a very uncomfortable death," were his words. My sister refused surgery. The doctor was angry with her for refusing what to him seemed the obvious path. My sister asked to see the palliative care specialist who agreed to treat her for pain as she died, which she did, peacefully, six days later. I am aware that it is considered good, even necessary, to "fight" against terminal illness. How much of the suffering we witness is actually caused by people being encouraged to cling to life for too long, with multiple surgeries, radiation and chemical treatments, procedures which are, in themselves, difficult to endure? Then, after all that, when the end can be avoided no longer, we ask for euthanasia. What would happen if we stopped talking about "fighting" against death? No, AO, palliative care is not the answer. It would be for me a slow death instead of a quick one. I would consent to quick euthanasia willingly but not to several months of fading away. It's as simple as that. Gauvain . The line drawn in this article underpinning its argument is stark, so stark as to not reflect reality. The double effect pointed to in point 3 supports this claim, even if the intention of it too is not necessarily as the author maintains, whereby his “even if” ought read, refecting reality, “in the knowledge that”. The effect on medical professionals themselves is one that isn't often discussed. As any member of the veterinary profession will tell you euthanasia is a confronting and difficult experience to get right and one of the biggest contributors to the high rates of mental distress and suicide in the profession. It is somewhat easier for everyone involved to morally justify in the case of pets but making these decisions about a person is not something I would wish on anyone. In practice this is never a decision made alone. Do we really want our Doctors and Nurses to be put in the position of being asked "what would you do if it was you?" when the question is "should I kill myself?" I am implacably opposed to any relaxation of the laws that prohibit euthanasia, on grounds that essentially honour the principle of double effect. Indeed, I regard the proposed Victorian legislation as an alluring and misguided beat-up, based on the shaky moral principle that good intentions are all that matter in facing end-of-life dilemmas. I accept therefore that a steady but loving and consistent commitment by Catholics and others to reject euthanasia as a popular expression of the principle of free personal choice is to be steadfastly and courageously maintained. 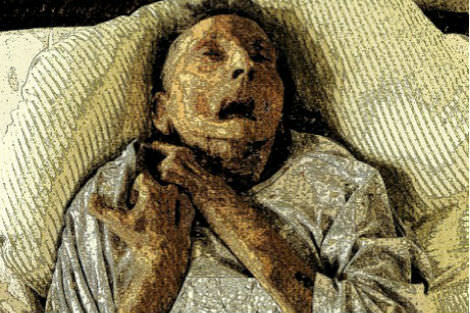 It bothers me, however, that Eureka Street appears to have used the image of a mummified corpse, and therefore of a museum artifact, rather than of an alive or deceased person or similar image to illustrate this excellent article. I think it adds a dimension of sensationalism and indeed horror that ill-becomes a Jesuit publication to employ on such a weighty and delicate matter, and which runs the risk of libelling Catholics as emotion-inducing fundamentalists, without the capacity or inclination to set out our case against euthanasia both lovingly as well as lucidly.